The Four State QRP Group is offering the new "HamCan" transceiver kit for sale at just $30. It is a 2 transistor crystal-controlled CW transceiver, delivering 0.5-1W TX power with enough sensitivity and selectivity to receive plenty of signals. They claim it is a minimalist yet good performance transceiver. 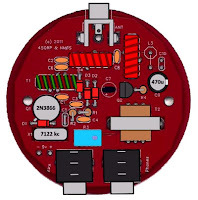 The kit features a high quality PCB, low parts count and fast and easy building. It is claimed to be an excellent kit for first time builders. It has been selected as one of the ARRL Midwest Convention's Buildathon kits. Hola Javier, consulta, cuando te tardaron en enviarte el kit?